What makes a real man? 10 studies to help you live purposefully and confidently for Christ as true Men of God. This set of Bible studies aims to unpack the answers the Bible gives to the question of identity that men face today. We will learn our God-given role in creation, how that has been ruined by the fall. And we will discover how we can start to be restored through the man above all men – Jesus Christ. Some things that emerge will be controversial in our culture, even in some of our churches. This course doesn’t set out to be politically correct but faithful to God’s counter-cultural word. 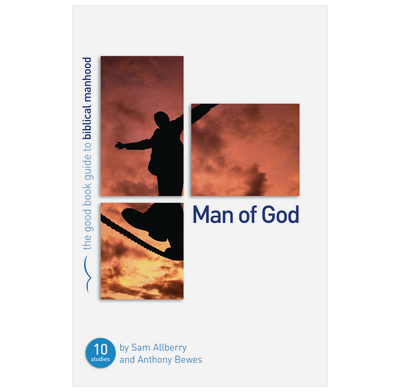 Suitable for groups or individuals, this guide covers all the major Bible teaching specific to men. Set within the big picture of God’s redemption for sinners through Jesus Christ, the heart-felt aim of the authors is that 21st century men will be set free from the slavery of human expectations, and enabled to live purposefully and confidently for Christ as true Men of God. I used this resource in my young men's small group and we all loved it. We really liked how it didn't hold back from communicating the truths that may be viewed as "hard" in our current society and applied them to our lives in an understandable way. It is deeply rooted in the Bible, and we all got a lot out of it. Looking forward to using more from this website! Very pleased to have found you. What service to send all books (50) in one package. Not like book depository who sent my first and last order individually packaged and posted. I recommend you for prompt and efficient service. I have thoroughly enjoyed working through this study. It has brought me great insight as to what it truly means to be a man of God. It really brings to light what a man's role should be and how through sin this role has become warped. I highly recommend this study for anyone who really wants to get to grips with what it means to be a man of God. Teaching the men in our church these lessons has both provoked and inspired them to live a Godly living as husbands, fathers, workers and church members. A typical reply during the lessons: We didn't know that's Gods purpose with our life! Highly recommended for personal, group or Church teaching. Im currently using this book as a 1-2-1 bible study with one of my young people, we are both finding this very interesting and would recommend it to all guys. A great resource for 1 to 1 bible study! I use it together with a few mates in a prayer group to work through. We find it very beneficial and often reminds us of the correct direction in which we need to head ourselves into.